Do you ever have those moments where you have infinite clarity? Where you feel right with the world and you know your place. I had one of those this weekend at Costco of all places. I met up with my mom on Saturday to check out the new Costco in our area. I needed some supplies for our upcoming Super Bowl party and my mom just likes to go to Costco or any grocery store for that matter. Apple doesn't fall far from the tree people. So we take our over sized cart, I'm convinced that this makes you buy more, and we start trolling the aisles. We look at the baked goods, I resist buying some warm out of the oven bread, my mom does not. And we move onto the fresh veggies and fruit section, once in the cooler case I had my moment. Across the whole case I saw them, 4lbs of Seckel Pears for only 4.99. I ran across the cooler case saying "Oh my god Seckel Pears" with my mom hot on my heels saying and they are only 4.99. And I'm not kidding with the running part, I told my husband about it later and he said he was glad he wasn't with me. So I promptly picked up the pears and put them in the cart, smiling from ear to ear. That was my moment where I knew that food is basically my life. Not that I didn't know it before but it was very clear then that food rules my life. Because this is the fact and because I grew up in a house where food was very important, as you can tell by my mother running with me to the pears. I have a hard time understanding why other people aren't like me, they don't run to Seckel Pears or know what a good cheese plate is and they don't care. So now that I have my role in life as a Foodie I feel it is part of my job to educate people on food or what good food is. Because life with out good food is hardly life at all. Preheat oven to 400 degrees. Cut puff pastry into 4 squares and make a shallow incision all the way around about 1/4 inch away from the edge. 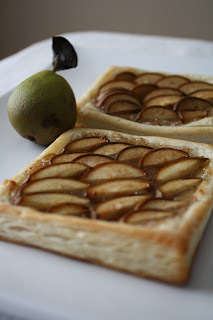 Spread 1 tablespoon of almond filling inside the incision and place sliced pears in what ever pattern you choose on top of the filling. Place on a parchment paper lined baking sheet and bake for 15 minutes. Serve warm and try not to eat all of them. Cooking (esp. baking) is my therapy. "Because life with out good food is hardly life at all." Katie, great post. I agree, foodies are in a world all to themselves. It's hard for junk food fanatics to understand unless we share our passion. 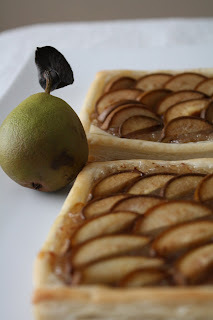 Great tart by the way. Your photos are beautiful! 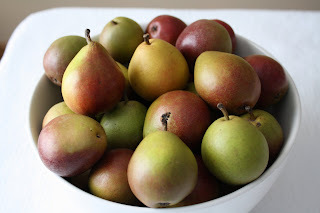 I love your moment of clarity and love seckel pears. What a great find! I often find I am most content when I can relax and I have a good stack of new food mags to read! Keep up the great job on your site!